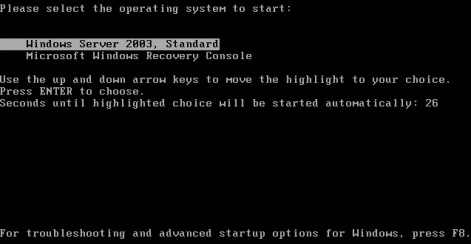 Windows XP, Windows 2000 and Windows Server 2003 features a Recovery Console which provides a mean for administrators or Windows user to perform a limited range of tasks using a command line interface, especially to recover of Windows system that does not boot into desktop in graphic user interface (GUI). Recovery Console is normally available and can be invoked by from the operating system setup installation CD-ROM, where users have to boot up from the CD, and then users can choose to repair a Windows 2000/XP/2003 installation using recovery console. For users that cannot boot from a CD, or feel reluctant to change the boot device priority in BIOS, it’s possible to install the recovery console into local hard disk so that recovery console option is available as a selection on boot-time menu presented by NTLDR. Setup cannot continue because the version of Windows on your computer is newer than the version on the CD. To avoid this issue, it’s recommended to install Recovery Console into Boot Menu right after Windows installation, else refer to this Microsoft article for workarounds. To install Recovery Console as a startup option, firstly log on to Windows 2000, Windows XP or Windows Server 2003 as an administrator or as a user with administrator rights. Note that if your computer is connected to a network, network policy settings may also prevent you from completing this procedure. Then insert the Windows 2000, Windows XP or Windows Server 2003 CD into the CD-ROM drive. A prompt will be opened to ask if you want to upgrade the Windows. Click No or close the window and ignore it. Replace x with the drive letter for the CD-ROM or DVD-ROM drive so that it points to the valid path to the appropriate Winnt32.exe file on the Windows CD, then following the instructions on screen. Once Recovery Console is installed into local system boot menu, it can be selected to run on every starting up of the computer without the need to boot from CD.